From Bahram Beyzaei’s Geneology of the Ancient Tree to Manichean literature influencing the post-Islamic Persian poetry, Samiee will cover methodologies through which the example of Shahrzad of the One Thousand and One Nights produces a particular mode of being for the artist in which the aesthetics and ethics are of the same category: Adab. Through that one can re-read the world history of visual arts as well as other forms of aesthetics from the point of view of Shahrzad and her ‘feminine-maternal ethical responsibility for the other’. Sam Samiee is an Iranian painter and essayist based in Amsterdam and Tehran. He has finished a two-year residency program at the Rijksakademie van Beeldende Kunsten in 2015. In his work, Samiee focuses on the practice of painting and research in philosophy, Persian literature, the history of painting and psychoanalysis. Characteristic of his work is the break from the tradition of flat painting and a return to the original question of how artists can represent the three-dimensional world in the space of painting as a metaphor, for a set of ideas. Therefore, most of his works are immersive painterly installations. A comparative readership of the history of Persian literature and western visual art read against the developments of psychoanalysis articulates the fields of Samiee’s interest and art practice. Subjects such as war, history of theology, psycho-geographies of landscapes and epistemic shifts have occupied the artistic explorations of Samiee through his embodiment of traditional and contemporary modes of art production and presentation. 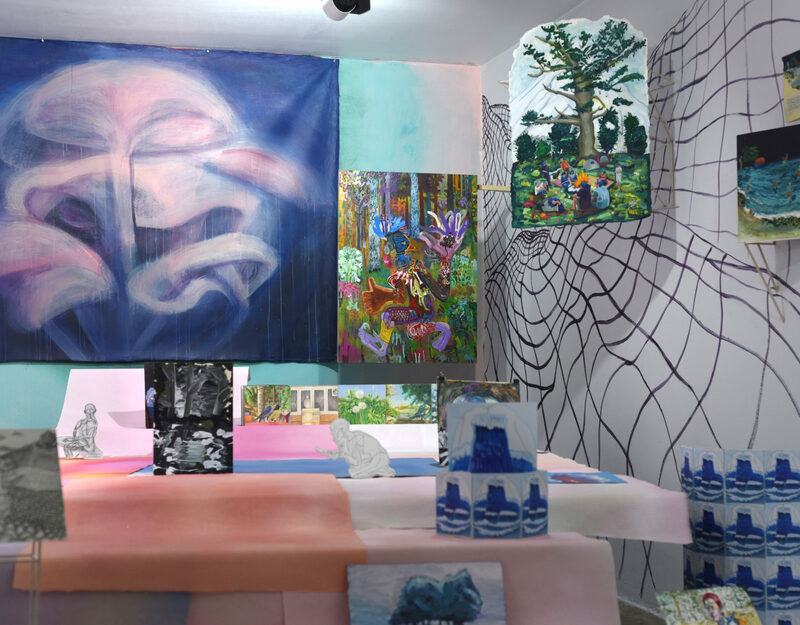 Image: A Camp, installation shot, curated by Sam Samiee, artworks by Manijeh Akhavan, Sadra Bani Asadi, Serminaz Barseghian, Aylar Dastgiri and Sam Samiee, 2017 Dastan’s Basement. Photo by Aram Tahmasebi.